So what services does Advantage Tax Help offer? Advantage Tax Help takes pride in offering our clients a wide variety of tax related products and services. We are a team of highly qualified tax attorneys, tax negotiators, Certified Public Accountants and associates who are dedicated to helping taxpayers find the best solution available in order to help you resolve your tax problems quickly. We recognize this is a difficult time for you and you are looking for quality tax help. Fill out our simple form and get the tax relief you deserve right now. Our tax professionals have years of experience successfully negotiating thousands of cases with the IRS and the State. Our team of tax relief expert advisors are highly trained in customer service and will be able to assist you in determining the best course of action to resolve your tax issues. Whether it's about tax levies, wage garnishments, bank attachments, offers in compromise, innocent spouse or similar tax related issues, we can help and answer all of your questions. Unlike many other tax relief companies we follow-up and keep you informed every step of the way until your case is resolved in your best interest. Advantage Tax Help offers an ongoing Client Support Line. Any questions or requests for case updates are answered directly by one of our qualified consultants. We will evaluate your situation and explain your options. Our services include but are not limited to: Bank Levy and Wage Levy, Garnishment Releases, IRS Collections, IRS Audits, Liens & Seizures, Delinquent Tax Returns, Offers in Compromise, Employment Tax Issues, Trust Fund Penalty Problems, Employee Plans, International Tax Issues, Criminal Tax Issues, Sales and Use Taxes, and other State Tax Issues. Our products and services are designed to help taxpayers find the tax help they deserve in their time of crisis. 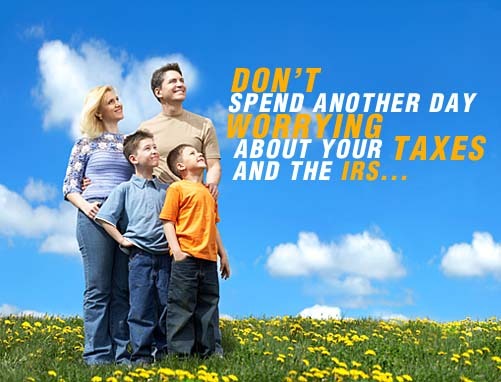 Don't let the IRS take advantage of you. Get the tax help you need to give you the advantage right now. Fill out the form on this page now for more information from Advantage Tax Help, including details on programs and services available for those who qualify. Yes, I'd like to receive occasional offers from Advantage Direct and their partners. We respect your privacy. Did you know? If you are experiencing serious tax problems such as a tax lien, a salary garnishment or have received an audit notice, things can get extremely complicated. If you don't know intricate tax laws, you could end up paying more than you really owe. The longer you wait to address your tax issues, the higher your penalties will go. To schedule a free consultation, call us at 1-800-711-9123 or fill out the form on this page and one of our tax professionals will contact you immediately.